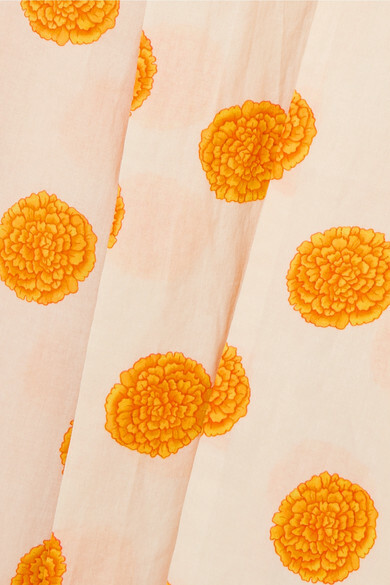 Rhode Resort’s best-selling 'Lena' maxi dress is printed with marigold blooms that pop against the cream background. Cut from cotton-voile, it's designed with a flattering wrap silhouette and has pretty tasseled trims and a tie belt to cinch the loose fit. Wear it with a straw hat and slides on your next vacation. Shown here with: Marysia Bikini top, Marysia Bikini briefs, Montunas Tote, Ancient Greek Sandals Sandals, Chan Luu Earrings, 1064 Studio Necklace.